In this blog, we discuss how to remove graffiti from walls and provide tips on the most efficient cleaning process. While Graffiti is a form of expression that looks incredibly artistic on street walls, it’s never quite appreciated on a building, and it probably wouldn’t receive as much appreciation! If you’re not responsible for exterior maintenance make sure you tell the facility manager if any graffiti appears on the building. If it is your responsibility, this blog on how to remove graffiti will guide you in the right direction. Using a high-pressure system might seem the most logical way to remove graffiti, but it can cause damage to certain materials. Knowing the type of paint used and the material it is on is key to helping you remove the graffiti. Baking-soda-based products can help restore vast areas of masonry, brick, concrete and other surfaces. But how it is applied can depend on the results. When removing spray paint, regardless of method, work from the outside, rather than across the stain. That way, the spot doesn’t spread to clean areas. On any surface, using abrasive materials too aggressively can leave the graffiti’s pattern scratched or shadowed into the surface. There is a particular method to use to ensure that you do not leave any obvious traces of the graffiti ever being there. Gather the necessary materials before you begin. You will need plastic tarps, sheets, and masking tape hold down and cover surfaces that do not require cleaning. Safety is critical, so ensure you have rubber gloves and safety goggles at the ready. Equipment such as brushes and scrapers will come in handy! Make sure the surface is dry and clean from dirt before beginning the graffiti removal process. Work your way down from the top of the surface and finish at the bottom, catching any liquid as you work you clean. Knowing how to remove graffiti depends on which type of graffiti it is. Chalk-based graffiti is best removed using pressure washers. However, spray paint will usually need some cleaner or abrasive such as baking soda-based products, paint thinner and acetone to work on masonry. The method of removal depends on the surface which the paint is on. Ease into the process and use the first attempt to trial and error. To begin, use the least-invasive method possible such as soap and water moving up to pressure washers. Why? Because materials such as brickwork might show vulnerability to high pressure-washers, whereas concrete is a lot more hardy in its nature. Take concentration away from the graffiti and focus on the bigger picture. You should clean the whole area rather than focusing on just the graffiti as it may permanently leave the graffiti outline on the brickwork. Apply a protective coating after the removal process as this will form a safeguarded barrier, preventing additional graffiti from sticking to the surface; with a protective layer, it is much easier to remove. If none of the above works, repainting is a good last resort, if you have the time to repaint the entire surface. You may even have to apply multiple coats to prevent the image from coming through. Before you discover how to remove graffiti yourself, you should discuss your situation with a graffiti-removal contractor. Local governments and towns are responsible for removing graffiti from public buildings, but it is the responsibility of the owner to maintain private property. Hiring a specialist to remove the graffiti for you can save you time and money in the long run. Graffiti removal can be tiresome, and busy landlords won’t have the time or energy to invest in the process. The cost of hiring a specialist will not only give back time but also the money you’d spend and miss out on where you could be completing other tasks. Our removal system deals with graffiti on painted surfaces, brickwork, or ‘ghost’ image as a result of the graffiti seeping into the texture of the material. The use of our low-pressure system means that we can remove graffiti from any surface safely. Taskforce UK is one of the South of England’s leading height access specialists providing cleaning and maintenance services across the region. 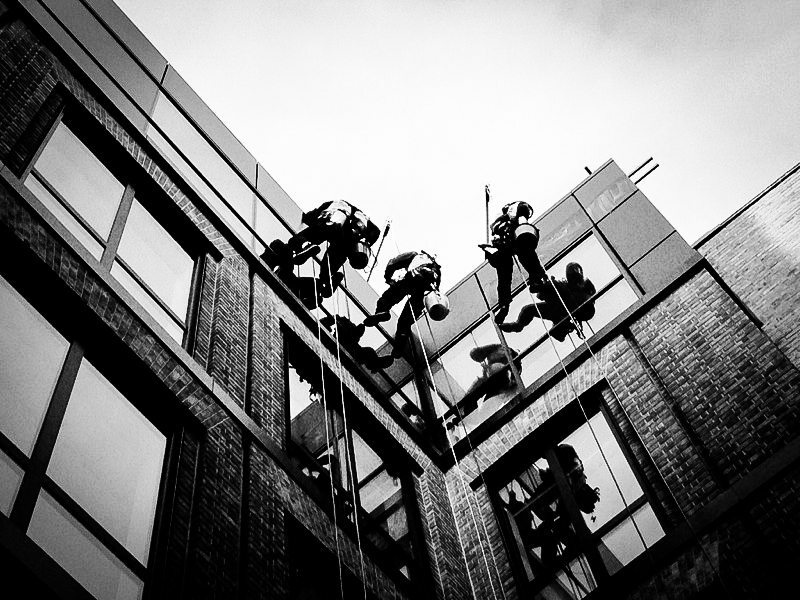 We can eliminate any worries you may have, by taking on the risks of working at height for you. Speak to the Taskforce team today about your requirement.